Nobody wants to pay a fine. 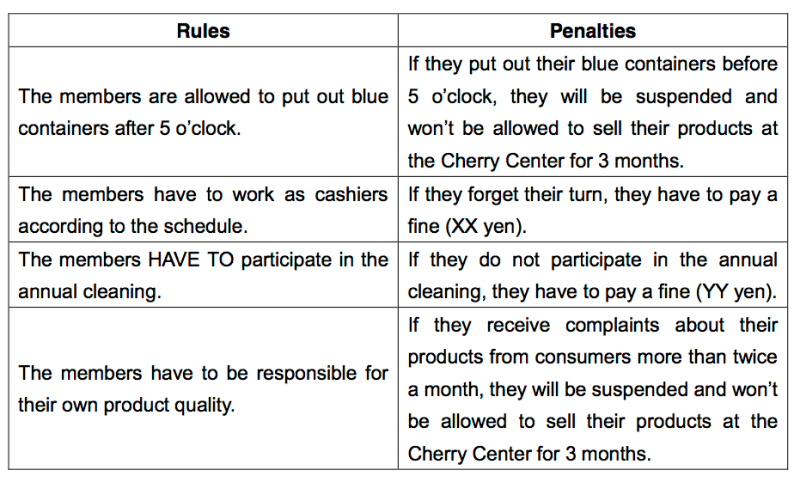 By enforcing the penalties, the members obey the rules. If they carelessly forget their turns as cashiers, they have to pay a fine. But nobody complains because the penalties are also decided by all the members. The fourth tip for success is that all the duties are shared among all the members, and opportunity is always given to the members equally. 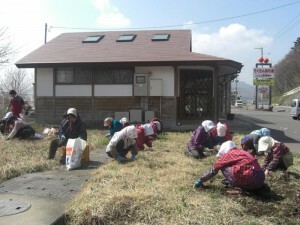 For instance, they have to participate in the annual full-scale cleaning. If they forget to attend the cleaning, they have to pay a fine. Cashier duties also rotate. Three members on weekdays, four on Saturdays, and five on Sundays and national holidays work at the register in rotation. Since there are about 100 members in the Cherry Center, every member works as a cashier once or twice a month. If they forget their duty (shift), they have to pay a fine to the center. If something comes up and the member cannot fulfill her duty, she asks another member if she can switch with her. The members are responsible for the same amount of duties, which fosters the ownership of all the members of the Cherry Center. Generally speaking, in any shop, products displayed near the entrance tend to attract more attention than in the interior of the shop. It is quite natural that people want to sell where their products sell better. If the places where they can place their products are decided based on a first-come first-served basis, conflicts may happen among the members. To avoid this, in the Cherry Center, where the members can place their products is decided by a drawing to ensure equality. No member can complain because it is decided that way. To ensure further equality, however, a drawing is conducted twice a year, on May 31st and December 30th. Even if somebody gets a “good” place, she cannot occupy the place for a long time. Conversely, even if she gets a “bad” place, she does not have to fret over this. She has a chance to get a better place in the next drawing. This system guarantees 100% equality and transparency among the members. What a nice system! When a member sells her products, the seller decides the prices of her products. 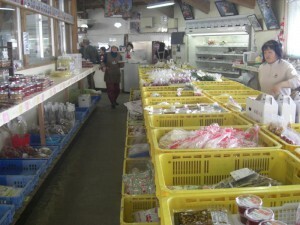 The products at the Cherry Center are priced a little lower than the equivalent products sold at shops in town. The Cherry Center receives 9% of the retail prices, and the remaining 91% goes to the members. For example, if a product is priced at 100 yen, 9 yen goes to the Cherry Center, and 91 yen goes to the member. The 9% of the sales received is used for the operation and maintenance of the Cherry Center. The members open an account when they become a member of the Cherry Center. The money, which is 91% of the total sales, is transferred into their own accounts three times a month (on the 5th, 15th, and 25th). This quick and frequent payment system helps their livelihoods and encourages them to work hard. There is another system that motivates them to work hard. In the office of the Cherry Center, there are small mail boxes for the members. Each member is given a mail box where information letters and sales records are put. Each member has to put a product price tag on each product in order to sell the product at the Cherry Center. 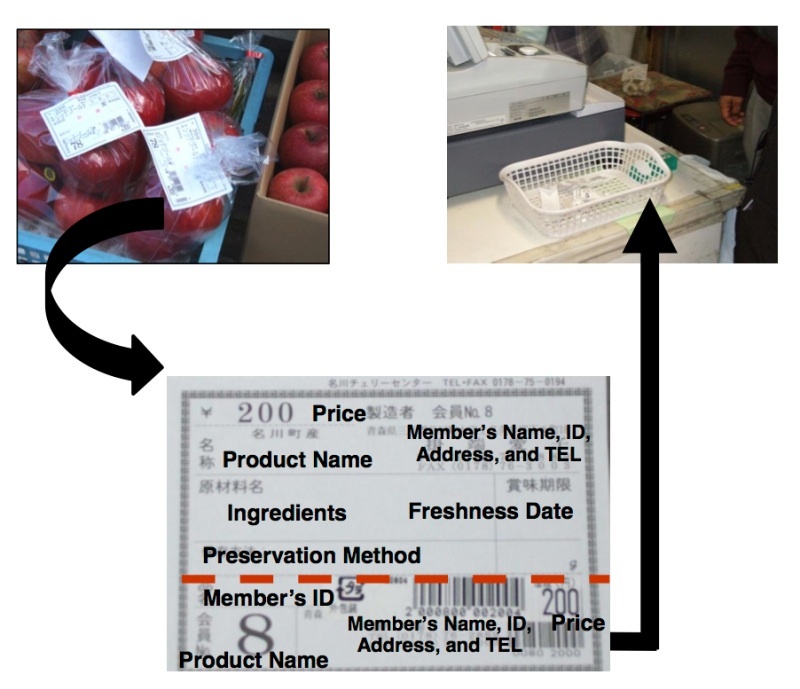 The tag carries information about the producer (= member) and the product, including the seller’s name, ID number, address, phone number, product name, price, ingredients, freshness date, and preservation method. At the cashier, the bottom part of the ticket is cut off on the perforated line, and is put in the basket beside the cash register. Later, the detached slips are put in each member’s mail box. Around 6 o’clock every evening, members come to the office to check their mail boxes. They take the collected slips back home. Based on those slips, they calculate their total sales for the day. Thanks to this system, they can learn how much they earned, also which product(s) and how many products were sold that day. Bearing such information in mind, they can plan their own production and marketing strategy. What is great about this system is that they can be better motivated to work for the next day. Every year, on December 30th, the Cherry Center holds a plenary annual meeting. In the meeting, the president reports to the members on the total sales of the year. When the sales are in the black, the profits are divided among all the members equally after the operation and maintenance costs are subtracted. Everybody can receive the same amount of the year-end bonus if the center keeps the balance in the black. Before the Cherry Center was founded, a few active women’s groups used to process agricultural products at the communal processing facility which had been constructed by the local government. 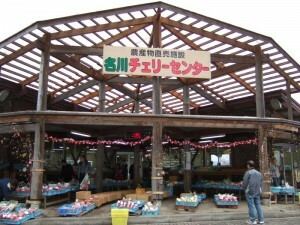 They developed some local specialties made from fruit such as peach nectar, plum juice, apple jam, and cherry sweets. 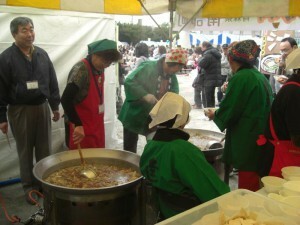 In those days, they sometimes participated in events and exhibitions which were coordinated through the local government. However, participating in events and exhibitions in other areas did not pay because of high costs for transportation, packaging, and other related fees. One day some women took the initiative and asked the local government to construct a farmers’ market in the community so that they would not have to go far away to sell their products. Responding to their request, the local government introduced them to a subsidy program offered by a public organization. When the women applied for the subsidy program, the local government helped them fill out the application and go through the procedures. Fortunately, they got the subsidy. With the subsidy and the local government’s budget, the Cherry Center was constructed. However, the women were not completely dependent on the local government. Prior to the commencement of the Cherry Center, each member had to pay membership fees. The collected membership fees were used for the operation of the Cherry Center. In the beginning, by contributing money to the group, the members could foster ownership in their minds. Since the first year (1991) of their activities, the Cherry Center has been flourishing. The members of the Cherry Center never forget that the local government provided financial support for the construction of the establishment. They also feel that the local government has helped them not only financially but also in other aspects such as coordination support and activity promotion. Thanks to the coordination and promotion by the local government, the Cherry Center has become well known in other areas, and the members have had a lot of opportunities to participate in special events and festivals both in and outside Japan. Thus, good collaboration with the local government is one of the important factors that have made their activities successful. As a token of gratitude, the Cherry Center donates part of their profits to a public organization in the community every year. 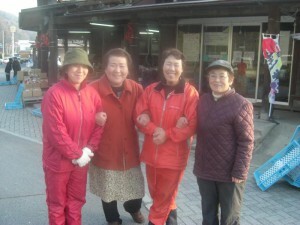 They feel deep in their hearts that they owe not only an “economic debt” but also a “social debt” to their community.